We all know that access to abortion has a central role to play in a woman’s ability to play an equal role in society. Comprehensive women’s policy agendas have addressed this linkage by including policy reforms to improve access to reproductive health care and address other areas of a woman’s life, such as the workplace and economic concerns. Starting in 2014, the National Institute conducted original public opinion research in New York, Pennsylvania, and Virginia to identify the links voters make between reproductive health and rights – especially abortion – and other policy issues, including those that directly affect the economic status of women and families. We found that most Virginia voters agree that there is a link between access to abortion and women’s financial stability and equality. In addition to support for proactive abortion policies, large majorities of Virginia voters also agreed with the economic proposals included in the proposed Virginia Women’s Equality Agenda, such as stronger laws to ensure equal pay for equal work, making sure all workers get a minimum number of paid sick days, increasing the minimum wage, and protecting access to birth control. A large majority of Virginia voters support the proactive, abortion-specific proposals in their legislative agendas (67% support protecting a woman’s right to access safe and legal abortion care). About eight out of 10 Virginia voters supports women’s legislative agendas overall (79%). Voters say they are more likely to re-elect elected officials who support women’s agendas that protect access to reproductive health care, including abortion (70% in VA). 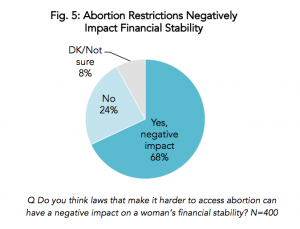 Nearly seven in 10 voters (68% in VA) say laws that make it harder to access abortion can have a negative impact on a woman’s financial stability. Majorities of voters in each state say that a woman’s ability to control whether or when she has children is related to her financial stability (64% in VA) and is an important part of equality for women (57% in VA). We found that large majorities of voters in each state support their state’s proposed legislative agenda around women’s issues. A majority of New York and Pennsylvania voters also support policies within these agendas that would specifically work to protect a woman’s right and access to abortion. This is not surprising given that a majority of voters in Pennsylvania and New York—like the country overall—supports the U.S. Supreme Court’s decision in Roe v. Wade. What is new, however, are findings that suggest voters recognize links between control over one’s reproductive health—including access to abortion—and financial stability and equal opportunities.